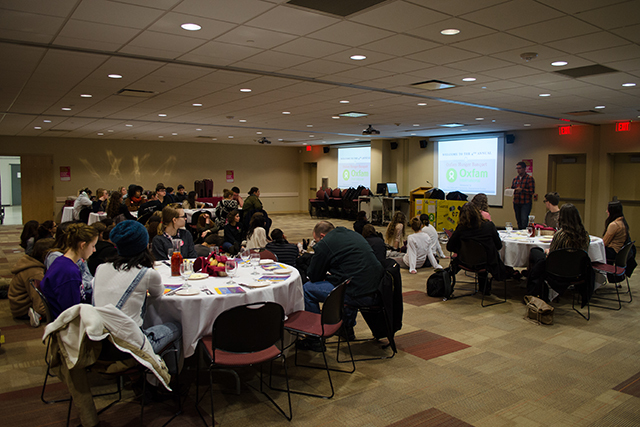 The Civic and Community Engagement Center sponsored their annual Oxfam Hunger Banquet in the Alumni Lounges on Wednesday. 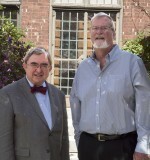 Moderated by Sean Farrell, the event focused on spreading awareness to Ramapo students about poverty levels around the globe. Upon entering the event, students were asked to pull a random slip of paper from an envelope telling them their economic standing, and thus where they would be seated during the event. The seating was organized to reflect the dispersal of wealth among the world’s population. The upper class had the smallest section, but had tables with a full restaurant-esque setting, along with baskets of bread. The middle class tables consisted of simply utensils. The lower class, the largest group, sat on the floor in between the other classes, surrounded by garbage. Before the meal simulation began, Farrell asked members of each class to stand up, and after giving them a new identity and a background story, moved them around depending on whether the story had left them wealthier or more financially burdened. After the meal simulation, the banquet ended with students sharing their thoughts on the event, and by trading stories of the types of poverty students had encountered. Like most of the students attending, Zachary Garfi was labeled lower class. “The lower class was a bit uncomforting. It was interesting, but sitting in between the other classes made me feel weird,” he said. Across the room from Kozan sat Katrina Buczkowski, one of the lucky few to be seated at the high class tables. The upper class was served a three course meal, while seated only a few feet away from those on the floor in poverty.